The Nyae Nyae Pans in the east of Namibia were filled up after good autumn rains. Stories abounded of lions that roamed the open grasslands. Of a massive flock of flamingos that had descended on the water. One word: paradise. So, what is it with Namibians and water? Perhaps it has to do with growing up in a desert country: when you hear about heavy rainfall somewhere in the country, about a pan that’s popped up out of dormancy, you have to go and see it with your own eyes. That is what happened. It was the Easter weekend and off we went, to chase the rain and see it all for ourselves. We travelled in six cars, nine adults and one baby. All of us family and friends. Between the whole lot of us only one Easter egg and six hot cross buns. Our leader: Chrisna Greeff, camper-extraordinaire (previously featured in the Camping Files in TNN Autumn 2018). 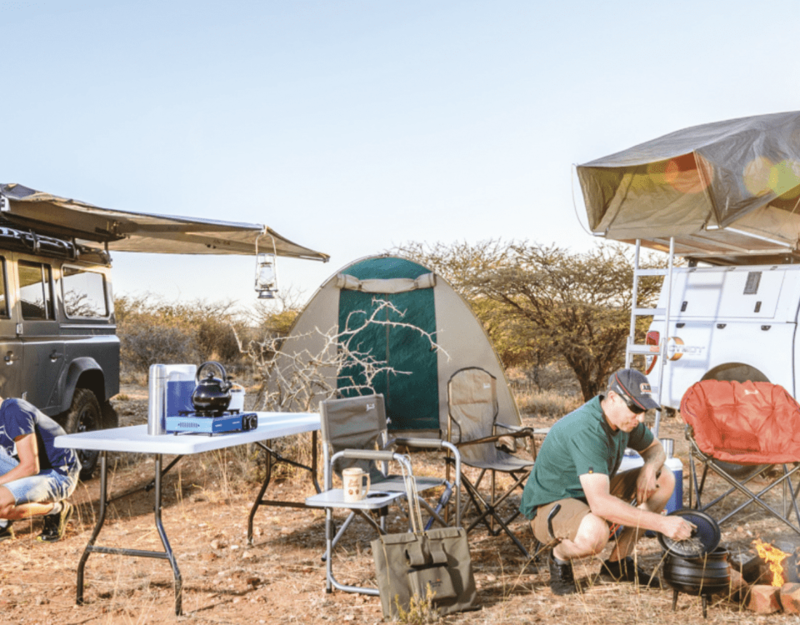 We had all been convinced to set off on this trip to the Nyae Nyae Conservancy by reports of lions at the pan just a few weeks earlier when a group of travellers spotted them catching springbok in the area. We hoped against hope that they were still there. But the lions were long gone by the time we arrived. Not altogether a bad thing, considering our group had a tendency to get out of the vehicles often. Despite the absence of lions the lush environment we found was reward enough for our journey. It is a luxury to see Namibia green. We don’t get that often. After a generous rainy season, it is as if every person you meet is just a little bit more cheerful about life in general. The east of Namibia was drenched, its red soil a muddy bog that had us slipping and sliding across 4×4 tracks. And in the end, enjoying a long weekend in the rain. Bumping over the rough terrain the car rocked me to sleep. I can’t help it, my eyes involuntarily close whenever I’m in a moving car for too long. Which is a pity, of course, since the road we took to the Nyae Nyae Pans was quite off the beaten track and picturesque. Experiencing the Namibia adventure in the rainy season, all muddy and wet and rough is a pleasure. But that was on the second day. In the downpour of the first day all, I could see through the rain-splattered windshield were the brake lights of the car in front of us. We were barely out of Windhoek before the rain clouds caught up with us. We got thoroughly soaked. Where we had planned to make quite a bit of headway on our journey, we ended up not getting very far at all. For our first night, we dropped in on some long-lost acquaintance’s farm and set up camp in the barn. Who would have thought of bringing a raincoat? Not me, that’s for sure. Rookie error, I was told. We cheerfully chatted the night away, falling asleep to the sound of rain drumming on the corrugated iron roof above us, small leaks drip, drip, dripping onto the concrete floor, missing our heads by a metre or less. And the next morning, wading through tall grass with dew still clinging to the blades, watching a lazy sunrise through the thick mist. The following day we were on our way to our final destination. We nearly didn’t get there, though, because due to some mysterious set of circumstances (i.e. forgetfulness) we almost ran out of fuel before making it there. Which made driving on a two-track dirt road with no other cars (let alone towns) in sight so much more exciting (and irresponsible). Luckily we reached a small village before the tank was completely empty and managed to buy a large 50-litre plastic can of diesel, enough to get us to Tsumkwe. The road to Tsumkwe was a long stretch of red earth with bright green bush on each side, the wilderness enveloping us. Thick with mud squelching under our wheels. We finally made it into town and stopped at the only fuel station, which happened to be a not-so-open general dealer, too. We were really lucky that they even had fuel. The locals are very keen to sell handmade bead jewellery and crafts. This community sees so little activity that I didn’t mind purchasing a bracelet from a small wrinkled granny with two barefooted grandkids. Tourism is just about the only industry in Tsumkwe, and it barely sustains the people here. The area features only marginally on most tourist maps. It also happens to be the homeland of the Ju/’hoansi, a subgroup of Namibia’s San. It is quite a distance to the pan. We opted to drive with a guide, thereby also making our contribution to the special and important work that TUCSIN is doing in the local San community. TUCSIN, or The University Centre for Studies in Namibia, is an organisation committed to education as a means of upliftment and empowerment. Its lodge in Tsumkwe is dedicated to supporting the marginalised San community. The ground squelches with excess water. Small turtles scuttle away from the danger of the game viewer’s wheels. And then finally, the pans. Stunning. Flocks of flamingo all the way from Walvis Bay on the coast, have they come to breed? Young ones, not as bright pink (perhaps they haven’t eaten enough canthaxanthin, the natural pink dye, yet) bring up the rear of the line. The rose quartz soldiers move as one, a wall of pink proceeding forward, scooping up nutrients with their large beaks. It is a paradise. Of course, it is. What else did we expect? I did wonder if perhaps the lions were just hidden in the thick foliage. It is a wild place, it brings out the wild in all of us. It’s finding turtles, small and large, in the pools of water. It’s seeing the wild landscape open up like the veld flowers that lend colour to it. The baobabs that stand proud and majestic. What really got us excited, though, was the birdlife. Yes, that’s right. We had a bunch of birders among us. We saw a variety of birds, the birders getting all riled up with the debate over what species of little black and white feathered jobs were squatted on the mounds ahead of us. It turned out they were Whiskered Terns, also found at the seaside. Then the ducks, geese, bee-eaters, spoonbills, African Openbills, Saddle-billed Storks, herons and the Wattled Cranes with their elegant train of feathers flowing behind them like the back of a little black dress. The overall impression of the Nyae Nyae Pans in autumn is what one would have expected in spring. The veld flowers coloured the expanse of the landscape a soft shade of lemon yellow, interspersed with lavender and pink. Lilies sprouted up between the tall grasses, eagerly reaching skyward for more rain. Tsumkwe is a small settlement in the north-eastern part of Namibia, about 40 km from the border with Botswana and 60 km south of Khaudum National Park. The nearest reasonably-sized town is Grootfontein, 250 km to the west. All the roads in the area tend to consist of deep sand (or mud in the rainy season) and should not be attempted without a 4×4 vehicle and a good measure of off-roading experience. The region was formerly known as Bushmanland. Nyae Nyae Conservancy is the second largest conservancy in the country, according to NACSO, with an area of 9 000 km2. More than 1500 elephants live in or migrate through the Nyae Nyae Conservancy. Tsumkwe is the ideal starting point to continue to the Zambezi Region via Khaudum National Park or to Botswana via the Dobe border post to experience the famous Okavango Delta.